If you're after a reliable, licenced, and experienced drainage plumber in Bundaberg give us a call. Our award-winning, affordable plumbing services will leave you 100% satisfied. Our Promise! If you're after a reliable, licenced, and experienced blocked drain plumber in Bundaberg give us a call. Our award-winning, affordable blocked drain plumbing services will leave you 100% satisfied. Our Promise! Are you experiencing plumbing issues in your home? Call now, our pros Plumbers Bundaberg are ready to help you. There are many things that you should consider. You will note that most homeowners have faced these issues at one time or another. Plumbing problems can stress you. One of the main reasons why you should hire a professional to check and fix your plumbing issues. Your pipes might start leaking without your knowledge at night. It can be detrimental. Your possessions might get damages in this process. The structure of your house or property might get affected. It is important that you fix this issue as soon as possible. Also, your toilet might get clogged at night. This can hinder you from utilizing the toilet. You should, therefore, choose our experts to fix these issues for you. The good news is that we usually offer 24-hour plumbing services. You can trust that you will get quality plumbing services at any time of the day. Our company usually has a great customer service team. You can trust that they will be ready to listen to you and answer all the questions regarding our plumbing services. You can, therefore, contact them anytime that you want. They are always ready to serve you. Are you looking for commercial plumbing services? You should choose our professionals for this service today. You will note that we have all the skills that can help solve all the plumbing issues in your property. We have some drain plumbers who can help unblock your drains. Besides, our team knows how to use non-invasive pipe repair techniques. That is another reason why you should choose our plumbing company in Bundaberg, Queensland today. We also have all the tools that can help solve all the plumbing issues in your home or your property. We are always ready to serve you. We are always ready to work around your schedule. This way, you can be sure that you will get scheduled servicing and maintenance of all sewer, septic and stormwater system. Consider our services today, and we promise you will be a happy client. You could call any plumber in Bundaberg to fix your blocked drain, but you should call the Bundaberg plumbing company that are the experts in all things drainage, from blocked toilets to blocked sinks and shower or even blocked stormwater pipes and septic tanks Nuflow are your local plumbers in Bundaberg that can fix your blocked drains fast! With state-of-the-art drain cameras, our plumbers get straight to the cause of your blocked drain and can even beam the pictures or video straight to your mobile device so that you can see that your blocked drain has been fixed properly. Nuflow Wide Bay are the most highly reviewed plumbers Bundaberg, our customers give us 5 out of 5 stars based on 73 reviews, here's an example of what they are saying about us.. Within about 4 hours, Sam from Nuflow Wide Bay was able to take my call, hear my problem, make a time, attend at that advised time, locate the problem (which two other plumbing companies have been unable or unwilling to find), clear the sewer, check it with a camera, and offer useful advice. He was willing to listen to my explanation of the problem and fix it.The fee seemed more than reasonable considering the excrement he must have to put up with, and even then, how do you put a price on getting the job done properly? The right gear, the right knowledge, the right skills, and the right attitude. Professional and friendly all the way. Really impressed by the service. Very thorough job and really appreciate the feedback to know what's going on with the system.Very pleasant workers- thank you guys. We Guarantee all our work, if your drain backs up again within 3 months of us clearing it for you, we will come back and clear it again for FREE. Our prices are very competitive. We want to solve your drain problem effectively, quickly and at a price you can afford. With our no dig pipe relining system, you don't need to have your yard dug up to repair a broken drain or pipe. With over 20 years experience specialising in drainage systems you know you're getting unmatched drain and sewer clearing expertise. We pride ourselves on being quick and effective in attending to your drainage emergencies while also caring for your home like it was ours. 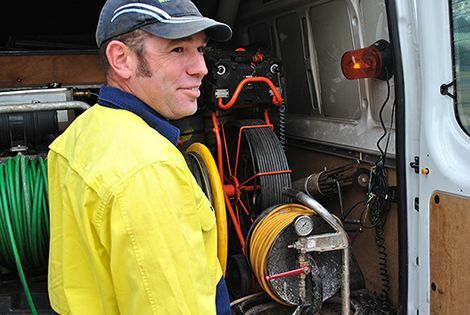 We do not take on general plumbing works, and this allows us to invest in extremely specialised drain cleaning equipment that is simply not viable for most 'all-round' plumbers in Bundaberg. We can be contacted 24 hours a day 7 days a week and we will respond quickly to solve any drainage problems you may have or to answer any questions and provide an obligation free quotation for your pipe repair needs.